Arching gracefully in all directions, ‘Vera Jameson’ sedum displays juicy round leaves and stems topped with pink, star-shaped flowers. Mexican snowballs (Echeveria elegans) anchor the right side, young pups bunched up against mother plants. In back, the nonsucculent Pelargonium sidoides catches the light on its silver leaves, echoing the color of the Echeveria. Pro tip: Pelargonium sidoides is a favorite to mix with succulents. Its fuzzy, ruffled leaves and wandering habit transform any combo from rigid to loose. 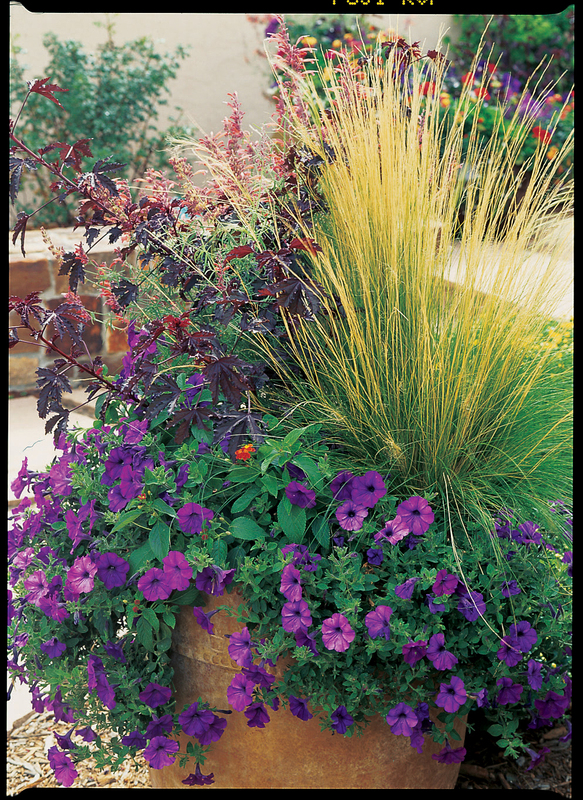 Plum-colored foliage is a rich accent against soft greens in these easy-care containers. 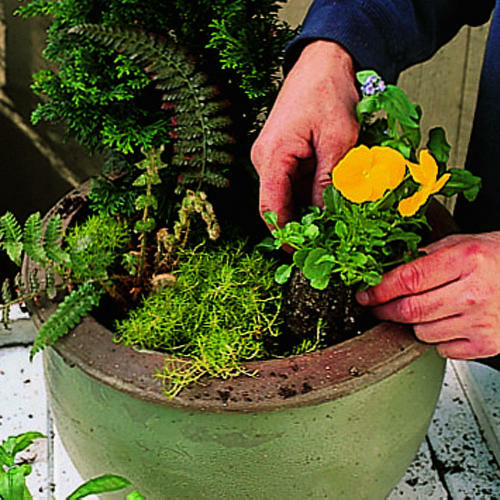 Arrange taller plants in the center or back, trailers near the pot’s edges. For immediate effect, choose large plants and big pots (shown above left: 10 in. across, 14 in. tall; right: 16 by 18 in.). Start smaller for a less pricey combination. Design: Daniel Nolan, Flora Grubb Gardens () Grow them: Pick pots with ample drain holes and use fast-draining potting soil. Set in full sun. Water well, then only when top several inches of soil are dry. Container at left (clockwise, from bottom left corner of pot): Aloe humilis (6 in. ); Phormium ‘Guardsman’ (5 gal. ); Leucadendron ‘Wilson’s Wonder’ (5 gal. ); Sedum rupestre ‘Angelina’ (1 gal. ); Echeveria pulvinata (4 in. ); Aeonium leucoble­pharum (6 in.). Container at right (clockwise, from bottom center of pot): Sedum rupestre ‘Angelina’ (1 gal. ); Sedum adolphii (4 in. ); Coprosma ‘Evening Glow’ (1 gal. ); Chondopetalum tectorum (1 gal. ); Echeveria ‘Coral Glow’ (6 in. ); Kalanchoe ‘Fantastic’ (6 in. ); Euphorbia ‘Ascot Rainbow’ (1 gal.). Designer Kirstin Erchinger of Santa Fe is a horticulturalist with a floral-design background. She starts with a plant she falls in love with, then selects companions that flatter it, not compete with it. She filled this 24-inch pot with ‘Maple Sugar’, ‘Sunset’, , ‘Landmark Flame’, and ‘Suncatcher Saphhire’. Container designer Mark Bartos likes to create maximum impact with a minimum number of plants. “Because this container was so narrow, everythying in it had to be [visually] strong,” he says. The galvanaized metal container, 16 inches wide by 28 inches tall, is from (about $18). Bartos raised it on a stack of concrete pavers. The plants: Adenanthos sericea, , rattail cactus (Aporocactus flagelliformis). Designer Bartos created these planters to fit a ranch-style home with a bit of art deco thrown in. They’re simple and contemporary; they’re large and have strong architectural shapes. Bartos prefers big pots ― 24-inch-diameter minimum. You need that scale to create drama. Each pot contains ‘Marjorie Channon’, , red ‘Dragon’s Blood’ sedum, and chartreuse . When speckled with blooms, Copia ‘Gulliver’s White’ bacopa looks especially cheerful in 5-inch-wide, glossy green pots. Just one plant went into each of these white ceramic ‘Cylinder’ containers, from . 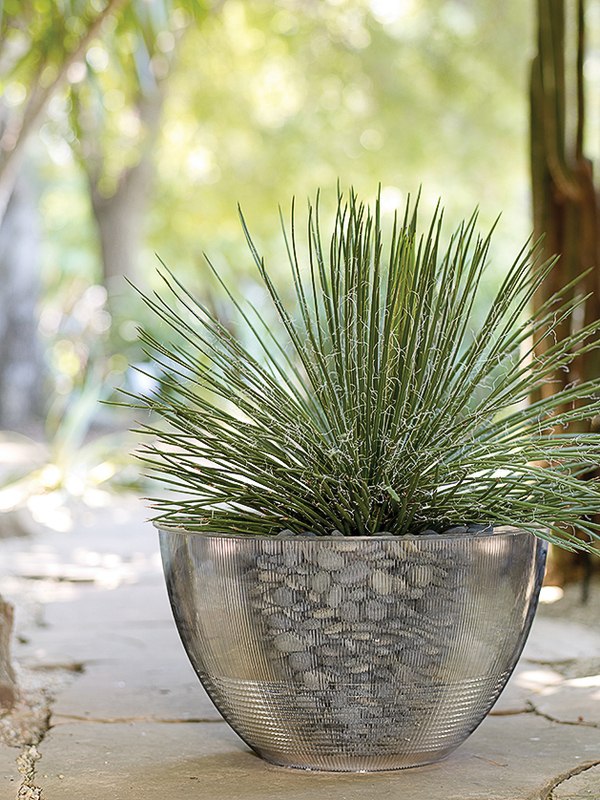 A single plant with a bold, sculptural shape is easier on the eye than a mixed planting. And a white pot allows it to shine. You don’t have to buy large, expensive specimens―smaller agaves, ferns, other other will work this way, too. Soft textures and bright chartreuse tones light up bronze-colored 17-inch-wide containers. The plants: Restio multiflorus: A wispy, grasslike plant that grows 3 to 4 feet tall or more, it develops brown seed heads that hang on through winter. : Stiff, narrow leaves have warm tones of olive and orange; plants reach 2 feet tall. : This spreading foot-tall plant has rounded grass green leaves. Coleonema pulchellum ‘Sunset Gold’: Feathery green-gold foliage glows in soft autumn light. Plants reach 1½ feet tall. Unwanted light fixtures (and other vessels) can become plant vessels with a contemporary edge. Be sure your object can sit upright (flat bottom). Because there’s no drainage hole, we recommend using plants that don’t demand much water. No such containers around your house? Try salvage yards for your own vessel to repurpose. Chasmanthium latifolium and Acorus gramineus ‘Licorice’ get into a delicious tangle in an oval gray stone container. When bruised the acorus’s leaves have a licorice scent. 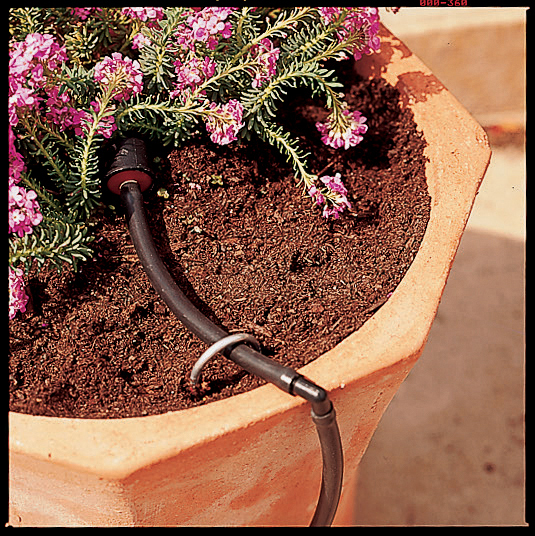 Dramatic, low-water and fill a pot in a drought-tolerant garden. A lush poolside planter almost glows with color, all from foliage. Medium green and lime green L. n. ‘Goldilocks’ tumble down the sides of the 16-in. square pot, while Stipa arundinacea provides a soft backdrop for ‘Rustic Orange’ coleus and blue-green . Bronze and chartreuse foliage mingle in a 16-inch rose-blushed celadon pot. The plants: : Fiery red new leaves fade to pink, then turn dark green when mature. This shrub prefers part-shade and can reach 10 feet tall. : The hardy wood fern’s feathery new growth blends copper, pink, and gold tones that turn rust-colored in fall. It grows 2 feet tall. ‘Little John’ azalea: Bronzy leaves make this azalea, which can reach 6 feet tall, a choice focal point. These pots, of different sizes but the same color, contain plants in shades that echo the garden’s overall scheme. In the smallest pot, fiber optics plant mixes with heuchera, lamium, and cyclamen. In the one at left, nandina pops against lamium, cyclamen, and hellebore. The tallest pot holds fine-leafed rosemary, cordyline, cyclamen, and heuchera. Follow these simple steps to create your own self- watering (technical term: subirrigated) pot and come home to happy plants. A reservoir at the bottom allows more time between waterings, while an overflow hole prevents overwatering. Start with a thin-walled, nonporous pot (at least 12 inches wide and 16 inches high) that has no drainage hole but will be easy to drill into—like the plastic ones shown here (Skörd planter, from $30; ). Drill a 1/4-inch- wide hole into its side, about 4 inches up from the bottom. Cut a disc of sturdy plastic (we used the lid of an old storage bin) to fit securely in- side the large pot when sitting on top of the soil- filled one. Drill 1/4-inch holes, an inch apart, in the disc. Cut a 1-inch-wide hole near the disc’s edge, then place the disc on the pot, inside the large container. Cut a length of 1-inch PVC pipe that’s slightly longer than the height of the large container. Cut the bottom of the pipe at an angle (so it won’t clog), and insert the pipe through the 1-inch hole in the disc. Push pipe as far into the big pot as it will go. Cover the top of the soil with plastic sheeting, cutting an X in it to let the plant through and tucking it down into the sides of the pot. Hide the plastic with a layer of rock or bark. Pour water down the pipe until it flows from the drainage hole. Refill as needed, likely once or twice a week. Echeverias and other small succulents, planted in a blue bowl, look like underwater creatures. “This is the It Plant of the moment,” says San Francisco nursery owner Flora Grubb of the icy blue powder-covered Echeveria cante, pictured at bottom left. “I’ve never seen a plant as iridescent as this one.” Here, the succulent shimmers against moody dark foliage—‘Cheryl’s Shadow’ geranium and ‘Black Adder’ phormium, which add structure in back. The 16-inch-wide container is made of lightweight plastic. A potted succulent may be pretty on its own, but group it with bromeliads and cactus, and it has presence. Whether it’s on a porch or is part of a large yard, a vignette of containers “condenses beauty in a small space,” says Oakland landscape designer Joshua Stenzel. In his work, he often mixes quirky drought-tolerant plants from Australia and the Southwest. The results are dazzling compositions that need only the occasional watering. “One thing I’ve learned with small-space designs is to skip the dainty little pots and go for big and bold,” says Stenzel. Make an impact by including one tall planting and repeating one strong color in either the foliage or the pots. The plants Left to right: Agave; Euphorbia tirucalli ‘Sticks on Fire’; E. tirucalli. “I almost always include something lacy, something hanging, and something architectural,” says Oakland landscape designer Joshua Stenzel. Then “throw in one thing that’s unexpected,” such as the Sempervivum succulents dripping out of a low pot here. The plants Upright Euphorbia tirucalli (back left); feathery Acacia iteaphylla (back right); Yucca aloifolia ‘Purpurea’ (left); strappy bromeliad (Vriesea philippo-coburgii, center); variegated ‘Cornelius’ agave (bottom right); cascading mistletoe cactus (Rhipsalis, bottom left). Start with a plant or pot you love and let it lead the rest of the design. For this quartet, akland landscape designer Joshua Stenzel first chose earthy ceramic pots, then selected plants in a complementary palette of coral and pale green. The plants Clockwise from top right: Gray-green echeveria; salmon-colored Kalanchoe orgyalis; variegated agave; and red-tipped Mangave ‘Bloodspot’. This orange pot filled with a Savour Greek basil tree adds a fun vibrance, making it a garden spotlight. If those fuzzy leaves in the rear look familiar, it’s because they’re lamb’s ears (Stachys), but a new variety: ‘Bello Grigio’, with slender, silver leaves that almost glow. At its base, Hebe pimeleoides ‘Quicksilver’ contrasts with its black branches and Jurassic-looking leaves. In a single pot (foreground, right), the spines of an Agave potatorum ‘Kissho Kan’ catch the light. At left, ‘Vera Jameson’ sedum stretches itself in all directions, offering pink flowers at the tips. Pro tip: Use one type of plant per container for a modern, color-blocked look. ‘Elijah Blue’ fescue and similarly colored Pelargonium sidoides look sweet and wispy, while their evil third holds court at right. ‘Grape Jelly’ dyckia forms a picture-perfect rosette of rigid purple foliage, but the leaves of this terrestrial bromeliad are armed with vicious teeth. Watch out—this combo is killer. Pro tip: Use more dyckias. They handle drought in stride and, every summer, send up tall stalks of bright orange or yellow blooms that hummingbirds find irresistible. Highlighting its red-tinged margins and sharp tips, a single ‘Blue Glow’ agave tucks up against a lush backdrop of soft plants. In back (from left to right), variegated Sedum lineare ‘Sea Urchin’ cascades over the rim; ‘Vera Jameson’ sedum shows off its pink blooms; and purple spurge (Euphorbia dulcis ‘Chameleon’) displays whorls of leaves on either side of an herbal-scented Pelargonium ‘Oldbury Duet’. Pro tip: When filling a large footprint, consider using multiple pots. They’re easier to move around, and you can play with their placement as planting evolves. A handful of Aeonium arboreum ‘Zwartkop’—dark purple rosettes on sticks—grow upward from the back of the pot. Next to them, silver woolly bush (Adenathos sericea) has a kelp-like quality, appearing to undulate as if growing in the sea. In the foreground, variegated Helichrysum peiolare, dark purple ‘Obsidian’ Heuchera, and a hybrid Echeveria balance colors and shapes from front to back. Pro tip: If you’re going for the kitchen sink look, add cohesion by echoing forms and colors. Succulent stars, including a blooming Echeveria hybrid and a trailing Cotelydon hybrid, nestle between mounds of soft ‘Elijah Blue’ fescue and bright green thrift (Armeria maritima ‘Armada White’). At far right, the silver heart-shaped leaves of a Pelargonium sidoides spill over the edge of the planter. Pro tip: Incorporate thrift into more of your plantings. The unsung plant is a playful and sturdy champ, forming tufty evergreen mounds topped with lollipop blooms in white, pink, or red. In the center of the container, a hybrid Echeveria sits like an unfolding lotus, but one with far more staying power than the fleeting flower. Small, almost iridescent ghost plant (Graptopetalum paraguayense) echoes the shape and color of the larger succulent. At right, purple-leafed heuchera picks up the Echeveria’s pink edges. In back, feathery dusty miller (Senecio cineraria) offers some stature and fuzz to the mix. Pro tip: Adding height, like the dusty miller, offers visual contrast, plus it creates dappled light for more sun-sensitive plants growing in its shadow. Spanning 18 inches across, Aeonium ‘Mint Saucer’ gives this combo some serious heft, like an oversized flower, but one that never needs to be deadheaded (an Aeonium lives a few years before sending up a stalk of yellow flowers and dying). Standing above it is velvety Plectranthus forsteri ‘Aureus Variegatus’, with limey green margins. Trailing at right is Rhipsalis teres heteroclada, a succulent with pencil-like stems. Pro tip: The old container recipe—thriller, filler, spiller—still stands the test of time.